Novice urologists sometimes lose their orientation in patients with complicated pyelocaliceal shapes. Controlling a flexible ureteroscope with skill requires a great deal of time and effort and also requires a certain level of expertise. 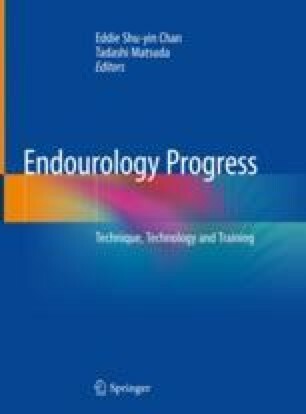 With recent engineering technological advances, there are few reports of real-time navigation system for accurate access to the upper urinary collecting system via percutaneous approach. In this section, we introduce our experimental ureteroscopic navigation system that uses a magnetic tracking device and evaluate the accuracy of ureteroscopic maneuvers in a three-dimensional (3D) pyelocaliceal system model. Our system could help surgeons with different levels to observe all renal papillaethereby by showing surgeons the real-time tip position of ureteroscope on the navigation image. In this section, we introduce our experimental model of ureteroscopic navigation system (ex vivo) using a magnetic tracking device. This concept may lead to increase the detection rate of upper urinary pathologies and the accuracy of surgical procedures. However, there are several challenges to overcome before clinical use, such as adding a built-in magnetic sensor at the tip of the flexible ureteroscope, overcoming pyelocaliceal intraoperative deformation (expansion and contraction) caused during saline irrigation and movements in kidney position with respiration.